Chemicals that are used in the manufacture of child car seats contained substances that are potentially toxic to a child in its developmental years, the Ecology Center revealed Thursday. Nearly 75 percent of seats were affected. The toxic chemicals highlighted included arsenic, bromine, chlorine, lead and other heavy metals, the nonprofit group found. Fifteen 2014-model car seats were tested in the study using gas chromatography/mass spectrometry, which measure vapors and chemical compounds. The tests checked specifically for flame retardant chemicals, as well as toxic elements such as arsenic and lead. The Ecology Center found that 73 percent of the 377 child car seats tested contained hazardous halogenated flame retardants, and more than half contained non-halogenated organophosphate flame retardants, some of which are hazardous as well. “Car seats save lives. It’s absolutely essential that parents put their children in them while driving, regardless of the rating a particular seat received at HealthyStuff.org,” said Jeff Gearhart, the Ecology Center’s research director, said in a statement. The study included car seats from Britax, Clek and Graco. Britax’s 2014-2015 Frontier and Marathon Convertible car seats and Clek’s Foonf convertible car seat were the best performing when evaluated using a methodology which tested for a range of chemical hazards in the products. Graco’s My Size 65 convertible car seat had the poorest rating. Repeated exposure to the chemicals found in the car seats have consistently been linked to thyroid problems, learning and memory impairment, decreased fertility, and cancer. Scientists were particularly concerned about what happens when a child spends hours in a car seat when that car seat is exposed to heat and UV-rays, because heat can accelerate the release of chemicals from products into the environment. 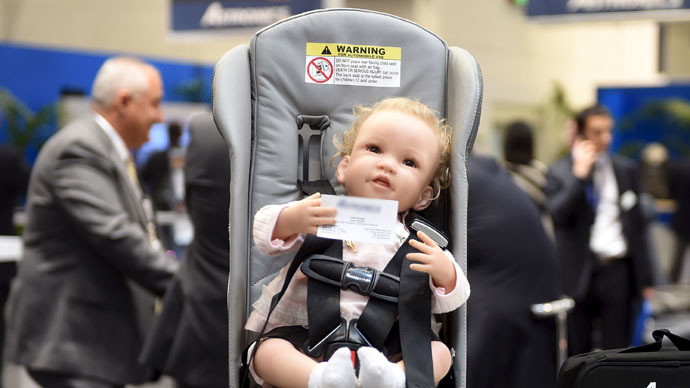 They also discovered that flame retardant chemicals added to the seat materials are not bound to the car seat, posing a risk that infants, toddlers and children can inhale, ingest or absorb the chemicals through the skin over time. The study is the fifth in a series begun in 2006. When it comes to government agencies, the Toxic Substance Control Act of 1976 made it the responsibility of the Environmental Protection Agency to evaluate chemicals in consumer goods, though enforcing regulations has been extremely difficult. The House Energy and Commerce Committee gave a nearly unanimous vote on Wednesday,accordingto the Hill, to a toxic chemical safety bill that would overhaul the 1976 act and give the EPA latitude to issue risk management regulations on products and have the rules apply nationally. The bill is headed to the House floor for a vote later this month.